Since the City of Hamilton first considered rapid transit in 2008, McMaster has worked in partnership to help define and advance possible options for better public transit. When the premier announced last year the province would invest in Hamilton’s Light Rail Transit system (LRT), she did so during a visit to the McMaster campus. As the LRT enters its next phase, the University, City and Metrolinx – the provincial agency overseeing the project – continue working together. Initial preliminary discussions have begun around location and design features of the LRT station servicing McMaster. In addition to the station, Metrolinx has also indicated interest in discussing with the University, the possible site for an LRT storage and maintenance facility. The station serving campus would be located on Main Street east of Cootes Drive. The LRT route runs along Main and King Streets, from McMaster in the west to the Queenston traffic circle in the east. McMaster hopes to use this opportunity to improve access to public transit on campus, while creating better infrastructure to support transit users. Should the initial progress continue and the discussions evolve, the University’s goal is to work with Metrolinx to create a campus transit hub, connecting LRT with a campus terminal building for all HSR and GO buses. While the details are still being finalized, the preferred site for the terminal building will be along Main Street to allow for connection with the LRT station. The hub building could include covered bus bays for GO and HSR, car parking, and public space for a possible welcome centre, offices and food, lounge and other services. 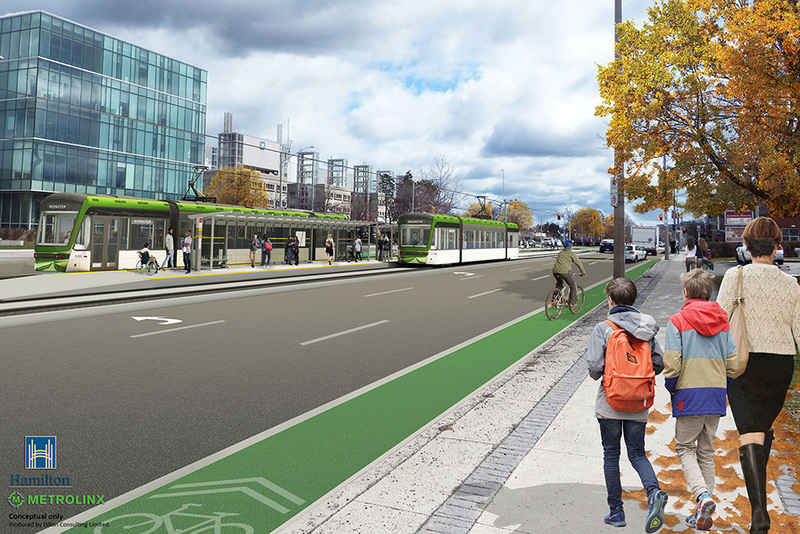 “The goal is a seamless connection for riders disembarking the LRT at McMaster, accessing campus services or getting on an HSR or GO Bus,” says Roger Couldrey, McMaster’s vice-president administration. The McMaster transit hub development would require formal approvals by various governing bodies and work continues on initial planning. Metrolinx requires a storage and maintenance facility for LRT where trains will be stored overnight and repairs can be made to the fleet. There are specific requirements for the facility including proximity to the LRT line and a site that is of appropriate size with specific attributes. Metrolinx reviewed dozens of sites across the city and approached the University about vacant property McMaster owns bounded by Chatham Street and Aberdeen Avenue, adjacent to the McMaster Innovation Park. The site is the former CP Rail Roundhouse and has not yet become part of the Innovation Park’s master plan. The University is working with Metrolinx and the City on the potential sale of the property to accommodate the LRT. Once details are finalized, approvals will be sought from the appropriate governing bodies. In the coming weeks, the City and Metrolinx are presenting Public Information Centres across Hamilton with updates on the entire LRT project. You may hear about these and other preliminary plans during this time.